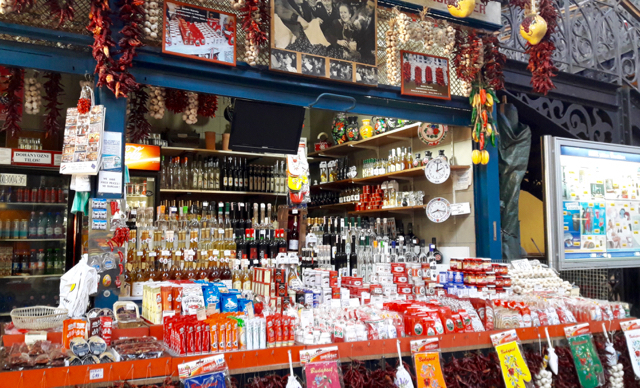 Pickles are essential in Hungarian Cuisine and sold at various vendors in Budapest Market Halls. 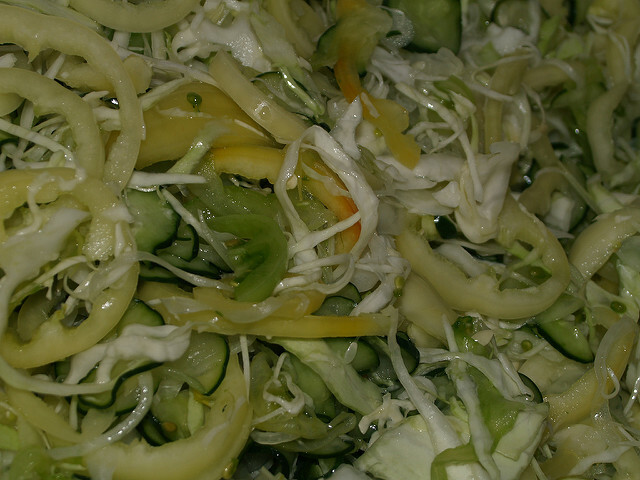 It is a second side dish (or replacement for salad). The sour taste makes it the perfect side for Porkolt and Nokedli. 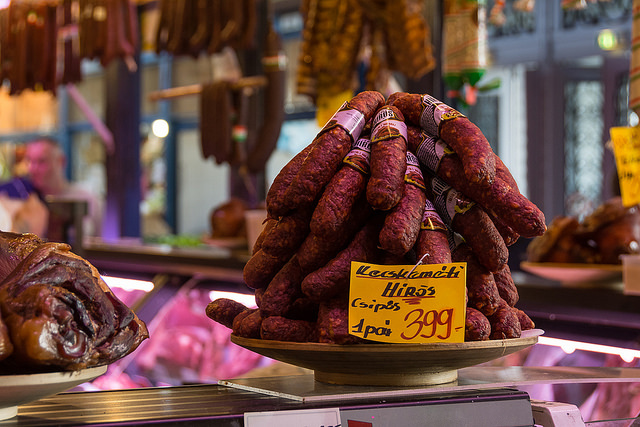 It is also consumed with fried or baked sausages, savoury noodles and spicy meals. 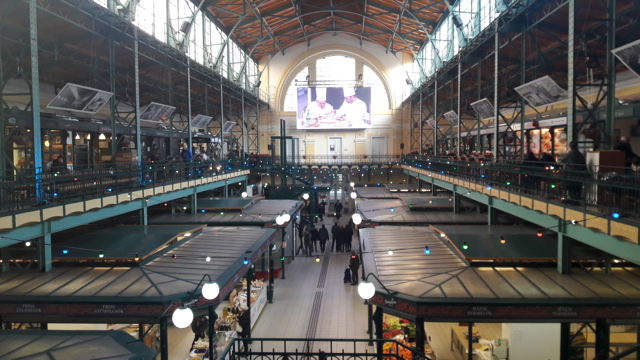 Join a Guided Market Hall Tour, and have a taste of the best Hungarian pickles along with some other traditional treats, while learning a bit of the food history of Hungary. Housewives are making pickles in the summer around the whole country. The shelf life of the pickles are long, so the family can have some gherkins or other vegetables through the winter months. In the old times, when there was no freezer, it was the only way to preserve some of the summer growth for the colder times. You can find picked Wax Peppers, Gherkins, Beetroot, Cabbage- stuffed Peppers, Tomatoes, Onions, Green Walnuts or even Watermelons. 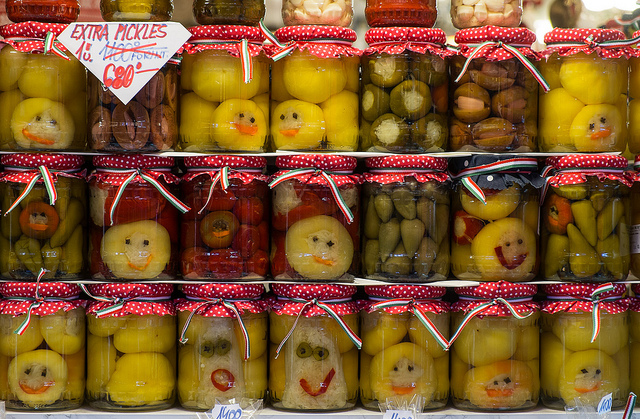 A jar of pickles from Hungary can be a good present for anyone who likes it. 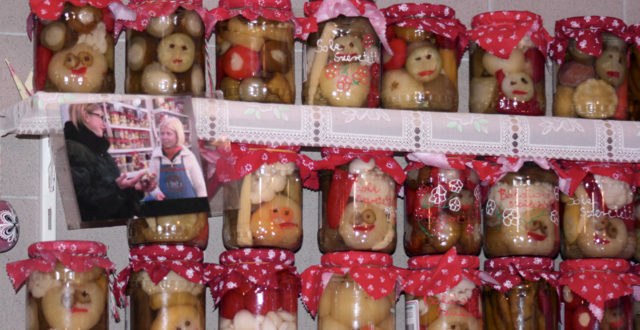 One of the most known pickles-producing town is Vecses. You can find Vecsesi pickles all around the country. Csalamade is a tasty mixture of pickled cabbage, carrot, onion and peppers and they’re all shredded as thinly as possible. It can be found in almost every market and it is loved by kids too. It goes well with stew style meals or with Schnitzel, basically it replaces the fresh salad. Hungarian people love pickled gherkins (Hungarian: savanyú uborka) and in the warm months they make kovászos uborka (“leavened pickles”) without vinegar. 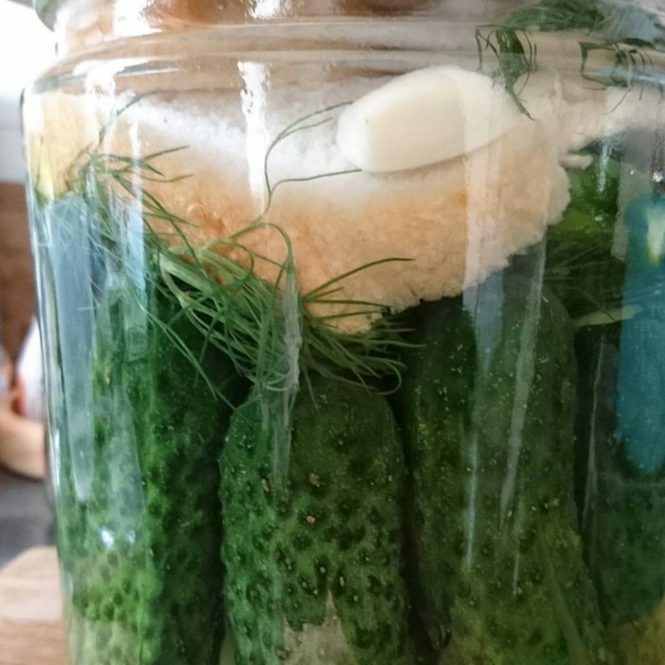 Cucumbers are placed in a glass vessel along with dill, garlic and spices (whole black pepper, mustard seed) covered with sourdough bread and soaked with a warm and salty water solution. The container is left to sit in the sun for a few days so the yeast in the bread can help cause a fermentation process. 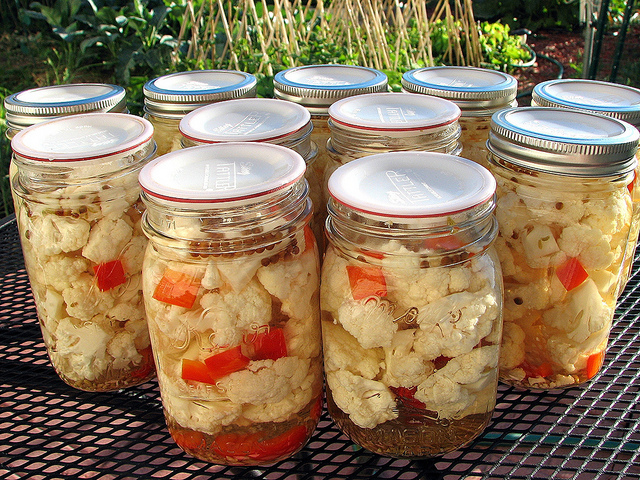 Pickled Cauliflower is made with vinegar and spices, it is crispy, sweet and sour, and often hot. Pickled cabbage is perhaps one of the great favourites of Hungarians (and Austrians, as part of the culinary heritage of the Austro-Hungarian Monarchy). 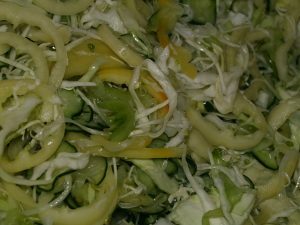 Pickled cabbage is made with vinegar and spices (e.g. pepper, salt), and squeezed into wooden barrels. Sauerkraut is essential in the Hungarian Cuisine. It can be a side dish, but it is also used for the famous dish Cabbage Rolls filled with Rice & Ground Meet (Toltott Kaposzta) or Cabbage Layered Casserole (Rakott Káposzta). The sourish taste goes well with meat and smoked meat and sour cream. Sauerkraut is a traditional meal, made by lactic fermentation and it helps increase the gut bacterias, so it is super healthy. The tiny onion pickle is made with vinegar, the onions are 20-30mm big. Similarly to other nations pickled pearl onions it is a pickle delicacy for snacks or as a side whenever you need something more acidic for the right balance. Cherry peppers are hot pickles in Hungary much beloved by the fans of hot spicy food, which, similarly to any hot foods in the world like chilli, forces the brain to release endorphines, making you feel happy. 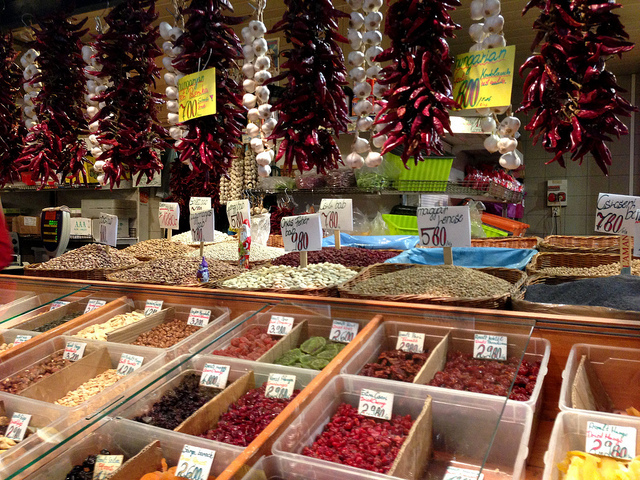 The pickled cherry peppers can be green or red, and they are pickled in whole without slicing them up, so all the hot hot seeds can remain inside to create the unique taste. Generally served with Hungarian style stews (chicken stew, beef stew, pork stew), breaded meat slices (breaded chicken thighs, breasts, turkey cutlets, etc.) slices of bread spread with Hungarian creamy paprika quark topping (korozott), or goose/ duck / pork lard containing some fried pieces. Tomato pickles are also made with vinegar and spices ( mostly onion and dill). The tomatoes are picked green before they are ripened, often when they are not fully mature, so it is not recommended to consume too much at a sitting if you are sensitive to acidic meals. Otherwise a great pickled snack, can be eaten alone or as a side dish, typically served with meaty dishes, like Hungarian style stews (chicken stew, beef stew, pork stew), breaded meat slices (breaded chicken thighs, breasts, turkey cutlets, etc.) and more. Pickled baby watermelons or watermelon rinds can be made with vinegar or with fermentation. It is a real treat from Hungary with summer meals or as a stand alone pickled snack, so if you like the sweet and sour tastes this pickle is for you. In Hungary, it is traditionally one of the sides near meaty dishes, like stews (chicken stew, beef stew, pork stew), breaded meat slices (breaded chicken thighs, breasts, turkey cutlets, etc. ).